Abstract: The Rebbe's first book, Hayom Yom, is usually viewed only as a daily guide to Chabad custom and study as well as a resource for short inspirational chasidic teachings. This is clearly an accurate assessment of its enduring value. What is often overlooked, however, is the context in which the Rebbe compiled and published the calendar: a time of unfolding crisis, which would escalate into the Holocaust of six million Jews at the hands of the Nazis. A careful reading of the explicit teachings and implicit messages of Hayom Yom, suggests that Hayom Yom was also conceived as a response to the crisis whose tragic culmination was yet to unfold. Reflecting a common theme in chasidic thought, the Rebbe sought to harness adversity as a paradoxical opportunity for good. The Hayom Yomm calendar was a way to imbue time itself with a special urgency, encouraging and intensifying the study of Torah, the performance of mitzvot and the devotional service of God. It was thus of a piece with other Chabad wartime efforts to rally world Jewry to intensify Torah, Mitzvot and chasidic piety in the hope that such activities would turn the tide of crisis and bring about salvation. Harnessing adversity as a paradoxical opportunity for good, the Ha-yom Yom calendar imbued time itself with a special urgency. The book has many special features: set out as a year-long day-to-day calendar, it begins on the 19th of Kislev, the “New Year” of chasidism. There are, in addition, genealogies of the seven chabad rebbes, listing wives, children, siblings, key life events, and major publications. Strikingly, the genealogies are headed by the forebears, with the famed Maharal of Prague (a great-grandfather of the Alter Rebbe) leading the way. But these preliminary notes are extraneous for those whose familiarity with Hayom Yom comes by way of hearing the day’s teaching in synagogue . Yet the book’s special features go beyond what one finds with a quick perusal.2 Importantly, it was the Lubavitcher Rebbe’s first book, undertaken at the direction of his father-in-law, Rabbi Yosef Yitzchak Schneersohn (Rayatz), the sixth Chabad Rebbe, who asked if he would “be so good as to compile a calendar for the year beginning with this 19th of Kislev until the next 19th of Kislev [5703-5704 (1942-1943)].”3 The calendar/book was thus a collaborative effort with the purpose to provide a “truly chasidic cultural work” even for readers with “minimal familiarity with chasidic teachings.” From that viewpoint, it has stood the test of time, serving the spiritual chasidic needs of today’s readers (or listeners) as it did for the initial ones. For the Rebbe, the horrible persecutions in Europe were anything but abstract. It is we today who overlook this anguished dimension of Hayom Yom. Certainly, many of these details were not yet known at the time when Ha-yom Yom went to print. Neither was it then known that the crisis that was rapidly enveloping the Jews of Europe would result in the systematic genocide of six million Jews, which we refer to today as the Holocaust. Hence, Ha-yom Yom certainly does not embody the Rebbe’s response in the aftermath of the Holocaust. Rather it is representative of his efforts to rally American Jews to the cause of Torah, mitzvot and chasidic piety, before the full extent of the Holocaust had unfolded and was known. The way the Rebbe dealt with the Holocaust in its aftermath must be dealt with in a separate study. The references to the total redemption through our righteous messiah certainly strike a familiar chord. But the world out of which these terms come is in upheaval: trembling, shuddering, spiritually (and literally) on fire. The introduction to the calendar via the Rebbe Rayatz’s vivid words charges the reader to address this upheaval directly, through action. It was no time to be a casual bystander. Multiple strategies were enlisted to intensify the effort, among them memorizing Tehillim and Mishnayot,10 and commissioning the writing of a Sefer Torah to welcome the messiah.11 Hayom Yom was a crucial facet of this urgent enterprise. A central goal of the calendar was to induce self-examination. This would, in turn, catalyze action which would alleviate the immense suffering and bring the redemption. The Rebbe returned to this message several times in the Hayom Yom calendar itself. On the 15th of Tevet, for instance, he related succinctly that “the sufferings befalling us are the birth-pangs of the messiah ”12; on the 8th of Shevat, he put it in the form of a community wide decree: “it is a mitzvah and duty of every rabbi in the Jewish community to inform his congregation that the current troubles and sufferings are the ‘birth-pangs of the messiah .’”13 A central goal of the calendar, then, was to induce a heshbon nefesh (self-examination) among all Jews. This would, in turn, catalyze action which would alleviate the immense suffering and bring the redemption. The very idea of such a book qua calendar was an innovation. No such calendar existed in chasidic literature, and likely none in Jewish religious literature.14 There had been attempts to adapt the non-Jewish idea of a “book of days” to the Jewish calendar. In 1931, a decade or so before Hayom Yom was published, the prolific English Jewish historian Cecil Roth brought out A Jewish Book of Days.15 Yet Roth’s book contrasts with the Rebbe’s in most every aspect. For instance, it uses a Gregorian calendar, beginning on January 1st and ending on December 31st, a decision he (a religious Jew) explains as facing the reality of what Jews generally referred to. In contrast, Hayom Yom not only begins on the chasidic “New Year,” and is organized from “Yom Rishon” to “Shabbat” (rather than Monday to Sunday), but it eschews the non-Jewish calendar completely. Every entry begins simply with the day of the week, the date of the Jewish month, and the Jewish year. There is no spiritual room, as it were, for the secular calendar. Time, as Hayom Yom projects it, is Jewish time, chasidic time, messianic time. The novel idea of a teaching calendar - a truly Jewish book of days - was the way to harness time to the project of teshuvah (repentance or return). Via the calendar and its teachings, time was stretched, reorganized, and measured according to a rigorously spiritual standard. Via the calendar and its teachings, time was stretched, reorganized, and measured according to a rigorously spiritual standard. This was true of the days of the calendar as a whole. Yet the calendar dates most likely to give further guidance of how to respond to the European catastrophe were those that commemorated past catastrophe. On the face of it, Tisha b’Av, the preeminent date commemorating Jewish tragedy, speaks only to the observance of the day. But on closer inspection Hayom Yom’s configuration of the three weeks leading up to Tisha b’Av, Tisha b’Av itself, and the seven weeks following may be interperated to reveal an extraordinary calendrical response to Jewish suffering. The three weeks preceding the 9th of Av are known as bein hamitzarim, and choreograph a gradual adoption of mourning customs. Shabbat of each week is distinguished by special haftorot, highlighting the theme of repentance. On Tisha b’Av, the day commemorating the destruction of the ancient Jerusalem temples, the customs of mourning are given their most intense expression, letting up in the afternoon. The seven weeks that follow, referred to as shiva d’nehemata, the seven consolations, feature Shabbat haftorot with words of comfort. These ten weeks, pivoting on the demanding mourning customs of Tisha b’Av, constitute a significant period leading up to Rosh Hashana. For three years R. Moshe Vilenker prepared himself for yechidut (private audience) with the Alter Rebbe. Afterwards he remained in Lyozna for seven years to translate (auf brengen) the yechidut into actual avodah (devotional service). The specific features of the time frame are significant. The chasid’s remarkable accomplishments took place over a ten year time span, divided into three and seven year periods. In the middle came the defining event: the yechidut with his Rebbe. This matches to a tee the period in the calendar that this 18th of Tammuz teaching initiates. And the correspondence may be carried over to the spiritual meaning. The ten years of toil parallel the ten weeks that precede and follow Tisha b’Av; the three years of preparation parallel bein hamitzarim; the seven years parallel the seven weeks of consolation. Hayom Yom’s configuration of the three weeks leading up to Tisha b’Av, Tisha b’Av itself, and the seven weeks following many be interperated to reveal an extraordinary calendrical response to Jewish suffering. What then parallels the yechidut, the decisive encounter with the rebbe that confers meaning and purpose to the time before and after? It is Tisha b’Av, the day that commemorates the destruction of the ancient Temples but also, traditionally, the day on which the messiah is born. Tisha b’Av is thus also, according to Hayom Yom, a day of yechidut, not with the Rebbe (though perhaps that too), but of the Jewish people with the Almighty. That destruction-filled day comes to signify, not the remoteness of the Almighty, but rather the intimacy with him. This message was clearly geared for a time when the anguish of world Jewry was at a height. Seeing the worse imaginable disaster as a time of “yechidut,” of spiritual bonding and avodah gave a way to confront the suffering of European Jewry and respond to it. The task was to alleviate the pain that comes with the birth of the Meshiach. The 18th of Tammuz teaching outlined this task in terms that the individual chasid could grasp. One detail is perhaps in need of explanation: Why did the Rebbe choose as the day of this teaching the 18th of Tammuz rather than the 17th, which officially ushers in the period of Bein hamitzarim? What is the special merit of the 18th? The avodah (the devotional service) it embodies. The 17th of Tammuz marks the breaking of the first set of tablets. On the 18th, as Rashi brings from the Midrash, Moses ascended the mountain to pray for Hashem’s forgiveness. The 18th, in other words, launched the avodah per se, which resulted in G‑d’s reconciliation with the Jews and climaxed - after the ten weeks and the yamin noraim - with the giving of the second set of tablets on Yom Kippur. Indeed, Hayom Yom’s teaching for the 17th of Tammuz sets forth the differences between the first and second set of tablets; this teaching hints at the tangible outcome of the avodah - the giving of the second set of tablets - even as destruction is occurring. Yet it is truly on the 18th that the avodah commenced. On the surface and beneath it, Hayom Yom then is geared to respond to terrible, overwhelming suffering. It presumes that during such a confrontation doubts arise as to the reasons for the vast suffering (how could they not?) and what to do in the face of it. Much of the time, the response set forth is indirect: know and maintain the tradition scrupulously; see oneself and one’s avodah as a link in the chain of that tradition; build up chasidic life at the very moment that it is undergoing unprecedented persecution; and, in the calendrical terms of “today is the day,” understand this as a daily task. Hence, Hayom Yom’s methodical listing of each day’s learning of Chumash with Rashi, reciting psalms, and studying Tanya: a program that clearly orchestrates a sacred response. By way of this calendar, the Rebbe sought to re-frame each day as an opportunity for an encounter with G‑d, and ultimately, an impetuous for the the mission to remove the terrible sting of suffering from a devastated world. Hayom Yom was brought into the world at a moment when the potential for both material and spiritual loss was at its peak. By way of this calendar, the Rebbe sought to re-frame each day as an opportunity to transform the nature of time as such. The result would be nothing less than a yechidut, an intimate encounter with G‑d, analogous to that which a hasid enjoys with his Rebbe. An encounter that would be an impetus for the subsequent work - the mission to remove the terrible sting of suffering from a devastated world - to truly begin. Post-prayer reading conventions vary considerably from one locale to another: it seems to be a more common practice in North and South America, less common in Israel. I hope to look at how, when and where the custom of publicly reading the day’s entry in Hayom Yom came into being, as well as the more general reception in Chabad communities. Republished first in Shanghai in 5705 (1945) and then only again in Brooklyn in 5717 (1957), the evolving pace of new editions (and translations) seems to have been modest for a number of decades, increasing only beginning around 5737 (1977). Rabbi Michoel Seligson’s two volume commentary on Hayom Yom has already demonstrated the rich web of allusions woven between the daily teachings, the specific learning (in Chumash, Tehillim, and Tanya), and the broader range of the Chabad Rebbes’ mamarim (discourses) and sihot (talks). Rabbi Seligson also speculates on a number of thematic patterns in Hayom Yom in his 5771 class. Rabbi Michoel Seligson, “The Hidden Treasures of ‘Hayom Yom’”, International Conference of Shluchos, 2011, 23 Shevat, 5771. CD GPO6. I’m concerned almost solely with Hayom Yom’s intersection with the Holocaust. R. Seligson briefly alludes to this intersection in “The Hidden Treasures of ‘Hayom Yom.’” He suggests that the Rebbe chose Hayom Yom’s entry for the 21st of Tevet, a teaching of the Ba’al Shem Tov that encountering water is a siman bracha (a sign of blessing), to coincide with the birthday of Rebbetzin Sheina Hornstein—the purpose being to convey a wish of blessing to her at a time when her precarious fate in wartime Warsaw was still unknown. Powerfully suggestive as this example is, R. Seligson does not address in other entries or more generally the Holocaust’s influence on Hayom Yom. The Rebbe’s introduction to the original edition quotes from the Rayatz’s letter (20th of Kislev, 5703) to him setting forth the “content and purpose of the compilation.” The phrase “truly chasidic cultural work” derives from Rayatz’s characterization of Hayom Yom published the following summer. See Days in Chabad, 2 Elul, 5703/1942, pp.2-3; and 25 Marcheshvan, 5703/1942- the dates when Rebbetzin Sheina and Rabbi Menachem Mendel Horenstein were respectively determined to have perished. The initial English translation of Hayom Yom, entitled From Day to Day (1988), notes these sad events in the margin next to the date. The most recent English translation, Tackling Life’s Tasks (2010) refers to the murder of Rebbetzin Sheina in the introduction. One of the Rebbe’s two brothers, Dov Ber, lived in Yekatrinoslav, and - notes current editions of Hayom Yom in the section “Geneology and Brief Notes” - “was murdered during the Holocaust by the Nazi rulers of the town of Igren near Yekatrinoslav.” More generally, the Rebbe spoke of losing “very close and dear relatives such as a grandmother, brother, cousins and others in the Holocaust.” See the coda to the Rebbe’s 5744 letter to a child of Holocaust survivors. The Rebbe apparently began to compile teachings for the next year (5704-5705), but left off after forty-seven entries. The entries have been collected - reproducing the Rebbe’s handwritten entries together with a printed version - at the conclusion of the Hebrew translation of Hayom Yom, edited by R. Peretz Uriel Bloy. The larger type font in the original Yiddish is reproduced in the English translation by the use of capital letters. Young Israel, 11 Tamuz, 5702. Igros Kodesh, vol. 6, 372. The Rebbe wove throughout the entries of Hayom Yom the importance of memorizing and reciting Mishnayot and Tehillim—beginning with the third entry on 21 Kislev. See thereafter 7 Tevet, 11 Tevet, 5 Shevat, 9 Adar I, 4 Nisan, and 9 Sivan. On the Sefer Torah to welcome the messiah , begun on 2 Iyar, 5702, see Days in Chabad, 9 Shevat (the date of its completion almost thirty years later), p.111. Letter 26 Iyar, 5702, Igros Kodesh, vol. 6, 340. 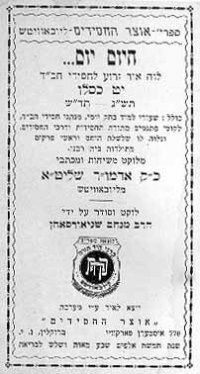 To be sure, a regimen of daily Torah learning linked to calendar - the Daf Yomi Talmud study cycle - had been launched by R. Meir Shapiro almost twenty years earlier, in 1923. But this program, while making use of the Jewish calendar, did not, as far as I am aware, orchestrate a calendar of its own. Letter, Igros Kodesh, vol.7, p. 231. Simchas Torah, 5697, Sichos HaShavuah, 5696-5705, p. 199. Letter, 18 Tamuz, 5699, Igros Kodesh, vol. 4, p. 540. Avraham Rosen is the author and editor of a number of books on Holocaust literature, testimony, and history. His book, "Keeping Time Sacred, Making Time Holy: The Holocaust’s Jewish Calendars," is scheduled to be published in 2018 by Indiana University Press.